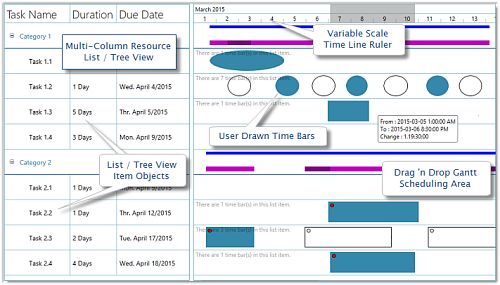 Solutions Schedule for WPF - brings full featured Resource schedule, planning, and Gantt style management to Enterprise Applications. From desktop to mobile computing platforms, extend enterprise resource management, scheduling and optimization functionality quickly and efficiently. Solutions Schedule for WPF is a comprehensive control for managing and presenting enterprise information in Gantt and Resource style presentations, for planning and scheduling multiple resources within the Microsoft .NET Framework. It enables developers to create fully functional Resource Gantt, Planning and Scheduling solutions in minutes using Microsoft Visual Studio. Solutions Schedule for WPF incorporates an optimized architecture and design making the control ideally suited for the most demanding applications, handling thousands of activities, resources, constraints and reservations. Solutions Schedule for WPF is designed for every industry in which valuable resources, including people, machines and raw materials, need to be scheduled and planned. 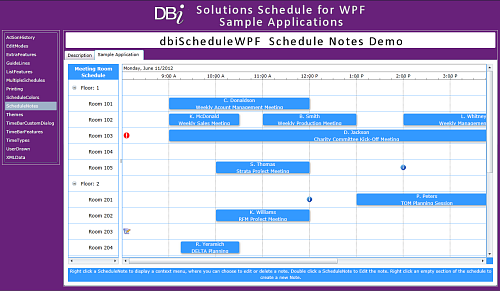 DBI Schedule WPF helps developers build the perfect front ends for desktop and Rich Internet Applications (RIA) in key areas of resource management and optimization, production scheduling and planning including logistics scheduling and planning. Developers can work in their preferred languages including: XAML, VB .NET and C#.